If tablets are the rising stars of personal computing, then Apple’s iPad burns most brightly. But now, Microsoft is preparing to crash the party in spectacular fashion with a pair of tablets that represent its first-ever Windows hardware. The folks in Redmond have spared no detail in reconsidering what a tablet can, and should, be. But what caught our collective attention was Microsoft’s end-to-end vision, as seen in its design choices. This wasn’t just another humdrum tablet that Microsoft happened to introduce; Surface feels stylish, fresh, and exciting. First of all, Surface RT runs on Nvidia’s ARM-based Tegra 3 platform and requires all-new apps that use the Windows 8 “Metro” interface; the Pro version uses Intel’s Core i5 and runs conventional Windows programs (as well as Metro apps). Microsoft says that Surface RT will be available when Windows 8 launches; the OS ships October 26. Surface Pro will follow a few months later. 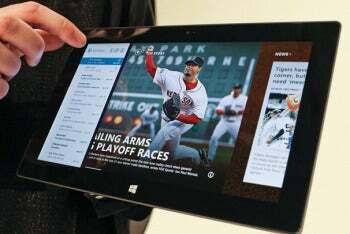 In taking the step to sell its own tablet hardware, Microsoft ensures that a flagship Windows 8 tablet will stand ready to compete against Apple’s iPad and the army of Google Android tablets, most of which have failed to find an audience. Based on Surface’s specs and my hands-on experience with a prototype of the Surface RT tablet, I expect Microsoft’s entry to leapfrog the largely undistinguished Android competitors and potentially pose a threat to Apple’s iPad hegemony. Smooth: Surface has a highly stylized design. First off, Surface has a striking look. The exterior magnesium alloy surface is silky smooth to the touch and finely finished; and the tablet feels solidly built and well balanced, whether held in one hand or two. While I wish it were slightly slimmer, its angled edges make it fairly comfortable to hold. Microsoft’s thoughtful approach to design addresses many shortcomings common to today’s tablets. For example, rival tablets require you to buy a case with a kickstand or some other device if you want to prop it upright to share content or watch a movie; Surface comes with a sturdy built-in kickstand. The kickstand is a brilliant stroke of design—a practical yet stylish flourish we wouldn’t expect from Microsoft. I lifted the tablet up and held it by the kickstand almost automatically, without considering potential consequences, but I had nothing to fear: The kickstand’s unique hinge felt as stable as bedrock. Kickstand: You get a pop-out kickstand, and USB. Another significant step: For the manufacture of the Surface screen, Microsoft is using optical bonding, which makes text clearer, minimizes glare, and improves contrast. Bonding is expensive, so few tablets use it; Google’s 7-inch Nexus 7, Acer’s 10.1-inch Iconia Tab A700, and Barnes & Noble’s 7-inch Nook Tablet are the three notable exceptions. Based on my time with the 10.6-inch Surface prototype, the display benefits greatly from Microsoft’s investment in this pricier process. The company has also reimagined how tablets could be­­come better productivity tools, starting with its clever Type Cover and Touch Cover. 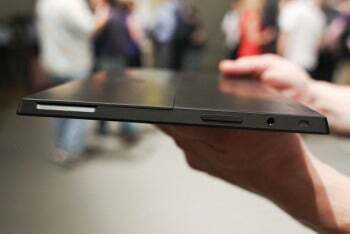 Whereas other manufacturers require a separate case with a keyboard or a dock that turns the tablet into a netbook-like clamshell (see the Asus Transformer Pad series of An­­droid tablets—the Infinity TF700 is the most recent—or Fujitsu’s Windows 7 Stylistic Q702, due in this third quarter), Microsoft’s “smart” cover provides the well-integrated tablet keyboard you’ve dreamed of. Versatile, lightweight, and functional, the Type Cover has mechanical keys and a multitouch clickpad to delight touch typists everywhere. The Touch Cover comes in a number of bright, cheerful colors, as well as the more staid black, and has flat, pressure-sensitive keys that detect when you are typing. If you flip the cover around to the back, the built-in accelerometer turns off the keyboard (a nifty trick). The Touch Cover is thin, just 3mm, and snaps into place with a sturdy clink, thanks to magnetics and aligning components that keep it in place. Because of this design, the cover feels more secure than Apple’s Smart Cover, which can easily slip out of place. Keyboard: An innovative cover attaches to the tablet. The keyboard options, coupled with the polished design and Windows pedigree of the tablets, describe devices that could give both existing tablets and traditional clamshell ultraportable laptops a run for their money. However, “could” is the operative word here. Until we know more-precise details about specs and pricing, predicting how well the two Surface models will compete in the marketplace is largely guesswork. I do suspect that, initially at least, the Surface RT is unlikely to be an iPad killer­. Microsoft didn’t reveal Surface’s price at the launch event. Also, apps are paramount to tablet buyers, and consumers are unlikely to flock to Surface RT until Windows 8 gains compelling Metro apps. Surface Pro, meanwhile, will challenge the current crop of laptops and Ultrabooks—and there it may well win. Why purchase a classic clamshell-style laptop if you can get a tablet that quickly and elegantly converts into a laptop when you need one—all without sacrificing performance, interoperability, or functionality? The big question is whether consumers can manage with a 10.6-inch display as their laptop screen; for many, the convenience of a tablet/laptop hybrid may be worth the downside of viewing content on a smaller screen. Next: Four unanswered questions about the Surface tablets.